Breast or bottle feeding or the issue of disposable versus washable nappies - there have always been choices and challenges in raising a child. Bringing up Baby, a new exhibition at Edinburgh's Museum of Childhood, is exploring some of them. It was the anniversary of the Scottish Baby Box scheme last year which prompted museum staff to come up with the idea. Partly it is a collection of seemingly ordinary looking objects which can actually say a lot about the way people have parented over the years. "All the different advice they're given, the different opinions they hear," says Lyn Stevens, curator at the Museum of Childhood. "That sort of excitement mixed with anxiety about the arrival of a baby and how are they going to approach parenting." The display is arranged on the themes of sleeping, feeding, keeping a baby clean and dressing them; glass cases full of items from across the decades - books, clothes, dummies, nappies and more. One case looks at clothing through the years and starts in the very early 20th century when baby clothes were usually made of lightweight, white fabric and were quite neutral in terms of whether a boy or girl was wearing them. By the mid-century onwards they have a display of knitted items, alongside a distinctive blue, synthetic smock top. "It's almost like a mini-Austen Powers outfit really," laughs Lyn Stevens. The museum has also added some up-to-date baby clothes. The boy clothes they have picked have logos which talk about heroes and soldiers, while the pink girl outfit is adorned with a net tutu and sparkly unicorn. "It's a choice of parents and family and friends what they purchase," Ms Stevens adds. "It doesn't have to be those but the fact that they're on the market is quite interesting." Many of the items on display would be familiar to a parent of whatever era but there are definite differences. Glass feeding bottles for instance, rather than more durable plastic. Then there is a whole display on nappies, including an early version of disposables called Paddi Pads, invented by a mother living in Scotland who was pregnant with her fourth child. "I can totally relate to her thinking 'I'm really fed up with boiling up lots of towelling nappies'," says Lyn Stevens. 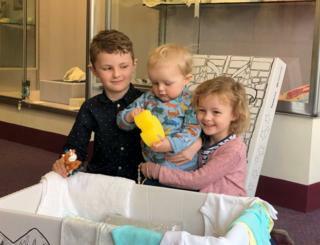 "It's really interesting that now that we have the choice, a lot of people are thinking of going back to the real nappies for environmental reasons and if they know they're planning to have more than one child it's also an economic reason." The exhibition runs until 29 September.